After waking up early we headed to the Chiang Mai bus station to catch a morning VIP bus to the Laos border crossing in Chaing Kong on the Mekong river. Upon arriving at the bus station we were told that there are no more tickets for the direct bus and were advised to take a VIP bus to Chaing Rai and then change for another bus to the boarder. 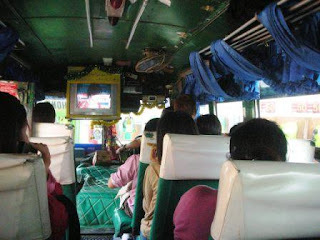 The bus to Chaing Rai was actually very good and comfortable, but upon arrival it turned out that the bus to Chaing Kong is a local bus – i.e. over crowded, designed for short Asian people so no space for our European legs and generally a little bit more adventurous than we expected. Luckily the journey was only 2 hours and we arrived alive in Chang Kong and after a short tuk-tuk (although it was probably the slowest tuk-tuk in town – I bet I could have run quicker) ride we arrived at the boarder crossing on hour before closing time (the boarder crossing only stays open till 5pm). Having paid exit fees, overtime fees (for the boarder officials for letting us cross on Saturday, being a non-standard working day) we hopped onto the boat for the Mekong River crossing. The village on the Loa side of the boarder is called Huay Xai and finally after another ½ hour at immigration (evidently Loa people are never in a hurry, despite us paying another overtime fee) we were in Laos. From the first look the difference between relatively richer Thailand and poorer Laos vas visible. It is as though the time has stopped in Laos about 60 years ago with very few paved roads, lack of electricity in many places and people mostly living in wooden or bamboo houses with no running water. Nevertheless we found some decent cheap accommodation and I’ve even managed to go for a run in the evening. Evidently the locals are not very used to tourists running around in lycra shorts and singlets as I had many cheers from both old and young people along the way. 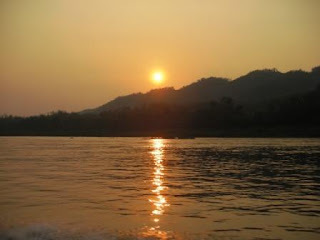 The next morning we boarded a slow boat for a two day journey on the Mekong river to Luang Prabang. The boat was actually fairly comfortable and we were glad that we haven’t opted for the uncomfortable speed boat taking one day only. We were able to take in the Mekong sites at a slow pace and had an overnight stop at the Pak Beng village. Pak Beng is considered just a necessary overnight stop in the middle of nowhere by most people, but we actually quite enjoyed the quiet village, had nice accommodation and dinner and I’ve even managed another run, again raising many eyebrows of the locals. Finally after 2 days on the boat we arrived late in the evening in Luang Parabang located in central Laos on the shores of the Mekong river. Luang Prabang is a World Heritage listed town and a former royal capital of Laos with 32 temples. Due to the World Heritage funding the city retained it’s original typical Asian feel, mixed with the French colonial architecture. From Luang Prabang we took a VIP bus to the town of Vang Vieng. Vang Vieng is a bit of a backpackers Mecca with guesthouses on every corner and bars serving Western fair (mostly burgers, fish & chips and pizza) and each blasting various episodes of Friends on the TV throughout their opening hours. The favorite pastime of all backpckers appears to be tubing down the Nam Song river in an inflated tractor tire. I’m not quite sure why the town is so popular with the backpackers, but we certainly found the scene a little bit distasteful (tacky, as Alex calls it!) and bought a bus ticket for the next day. 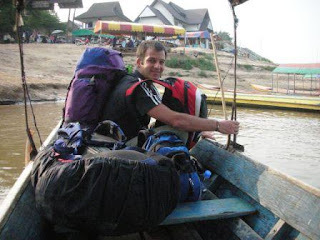 Relaxation at a Rasta bar on the river – Vang Vieng style! 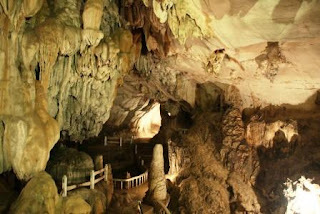 Before leaving for Vientiane in the morning we’ve managed to visit the Tham Jang caves. The “VIP” bus to Vientiane turned out to be an old min-van so we’ve arrived covered with sweat and a little bit worse for wear, so apart from a run on the local athletic track (which was great and free!) we had dinner and an early night. HAPPY EASTER. I hope you had great time. Guess what. It is snowing in London. For the last couple of days (during Easter holidays), it is snowing every day. Maybe by the time you will return back, the weather will be better. As always, great photos and great places. we are currently on phi phi island - siuth of Thailand. It is very hot here - we are trying our best not to burn on the sun but is is not easy, lots of red people here.